Call 1.855.746.7395 to request a catalog or to speak with a representative. National Gift Card is the best place for you to order Destination XL gift cards in bulk. We are the experts in all things gift cards and can set up your gift card solutions program for you today. 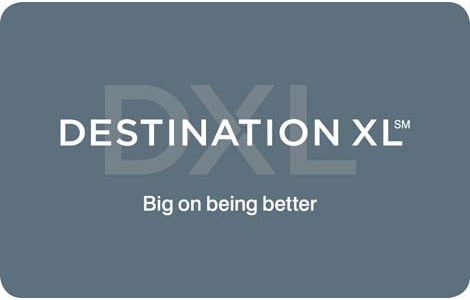 Please contact us for more information on Destination XL bulk, direct-to-recipient, or individual gift card fulfillment for your gift card program. Contact us here or call us at 888-472-8747 today! Prepaid card is redeemable at Destination XL, Casual Male XL and Rochester Big & Tall stores, or online at any of the six websites listed above (7 gift cards per online transaction). To check your gift card balance, call 1-800-206-9307 or go online. No expiration date. Cards will not be replaced if lost or stolen.